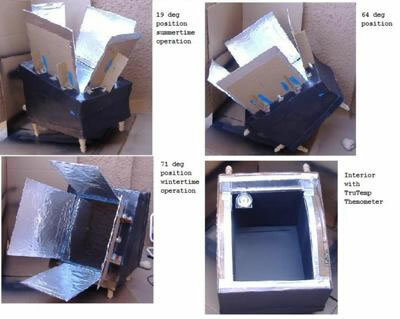 This is a homemade solar box oven made from corrugated cardboard packing boxes from Home Depot (R). The solar oven sections were cut from the packing boxes with a standard box cutter and glued together. Insulation between the inner box and the outer box is commercial high grade firm foam from R-Tech Industries (R). Insulation thickness is about 2 inches on all 4 sides and on the bottom of the oven too. The Solar Oven was glued using water resistant wood glue from Titebond II (R). The thermometer is a TruTemp (R). The reflectors were made from heavy duty aluminum foil. The Reflectors are attached and mounted using Rare Earth Neodymium Super Magnets. The cardboard was cut so that the magnets could be embedded into cardboard so they don't stick out. L-Brackets are used to hold the reflector panels onto the oven. The glass for the oven is dual pane 12" X 16" X 3/32", the gap between the two panes is about 1/8". The Lid to the Oven (which secures the dual panes of glass) was also made from cardboard cut out sections. The interior space of the oven is 15" X 11". Great information on a great effort at constructing a very feasible and effective solar oven. This is the kind of detailed information we like to share with our site visitors. Thank you for all of the effort and the photos as well...you can share with us any time you like.